10 minutes at ((BOUNCE))™ is the same as a 30 minute run - plus the whole point of jumping on a trampoline is to have fun! There's oodles of scientific research on the benefits, but most notably, NASA calls it "The most effective exercise yet devised by man" due to the extra gravitational force that the trampoline pad adds. Performed on mini trampolines, ((BOUNCE))™ makes exercise fun with choreographed dance routines. ((BOUNCE))™ improves weight loss 3 times quicker than floor based workouts due to opposing gravity and added g-force. Our 1 hour class features the first 40 mins of choreographed dance-cardio jumping routines to burn calories fast and finishes with 20 minutes of muscle toning concentrating on abs, legs, triceps and glutes. A focus on 'interval training' provides short breaks throughout the class to programme the body to burn calories at rest. It's fun, friendly and fierce with one requirement: you can't jump without a smile! BARRE WORKOUT - inspired by ballet, Pilates and dance. This challenging but fun workout focusing on the whole body. The class mixes cardio, resistance and strengthening exercises which can be low impact or high, depending on the individuals ability. This fun but challenging workout is choreographed to motivational music and NO dance experience required. So if you have two left feet... don’t worry! This workout just requires a love to keep fit. I started my dance career many years ago. Originally from Cambridge, I studied at Impington Village College and then went on to pursue vocational dance studies at Northern School of Contemporary Dance, where I graduated with a BA in Performing Arts and along with colleagues danced professionally in various locations. After graduating from I took time out of the dance industry and later had my daughter. While on maternity leave all I could think about was getting back in shape and my wish to join a class that pushed me as much as dance did, but after this time out, I lacked the confidence to actually join a class. That's when I found BarreConcept and I was hooked! My body has bounced back to when I was a dancer and it excites me. I am now a qualified BarreConcept teacher and enjoy every moment. Now I run my own business, am REPS qualified and I'm currently training to become a Les Mills instructor – Body Attack May 2016. 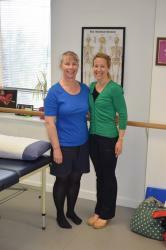 Petra is a physiotherapist who has specialised in musculoskeletal rehabilitation for many years and currently works at Bury Physio, a large private physiotherapy practice. She has previously worked in the NHS for 19 years, the last twelve years of this was at Addenbrookes hospital, where the majority of this time was part time in the spinal triage service. This involved working closely with rheumatologists & neurosurgeons, seeing patients with neck and back pain and being involved with investigations. Currently, Petra commonly sees people with sports injuries, sprains and strains, back or neck pain, and overuse injuries. Treatment usually involves advice, hands on therapy and active exercises, with the aim to improve symptoms and to reduce recurrence. She is also interested in prevention and aiming to optimise the way people move to reduce strain and improve efficiency of body movement. Petra also enjoys attending adult ballet classes regularly at Colours of Dance. We also offer informal practice sessions for any student to come along and practice the choreography being taught at the time. We use a local dance studio with a sprung wooden floor and mirrors for both the workshops and practice sessions. Having a passion and enthusiasm of dancing and performing from a young age Victoria continued this on through her studies in Dance / Dance at Liverpool University and onto Laban Contemporary School, London. Performing and teaching with the Jiving Lindy Hoppers Dance Company for a few years took her to New York and perform at the Celebration of Frankie Manning a founder in the dance style was a highlight. Working as a Dance Development Artist at Epping Forest Arts for many years has given Victoria lots of teaching experience in schools as well as working with the Elderly and the general community. Developing and teaching the youth dance program in the district and hosting dance platforms using a wide variety of dance styles to capture the audience. 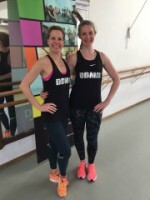 More recently having become a DDMIX instructor (Dance, Diverse, Mix), a fun, energetic full body aerobic workout using dance steps created by Darcey Bussell is a new focus to get more people up and dancing.